RapNet XL is a powerful add-on for Microsoft Excel which allows you to combine the power and flexibility of Microsoft Excel with RapNet and the Rapaport Price List. Using RapNet XL allows you to: Manage your inventory, calculate and compare diamond pricing and more. With a click of a button, your diamond inventory is now instantly accessible to other RapNet buyers. RapNet XL is available exclusively for RapNet members at no additional cost. Please note that RapNet XL supports versions of Microsoft Office for Window PC’s only. What does RapNet® XL offer? Upload your inventory to RapNet® – one click updating and uploading. Automatically synchronize your inventory with the latest Rapaport Prices. Calculate your diamond inventory based on percentages off Rapaport Prices. View RapNet® best/average prices as well as the Rapaport Prices next to your inventory. Download your current RapNet® stock directly to Microsoft® Excel®. Update your online diamond listings instantly, with no delay. 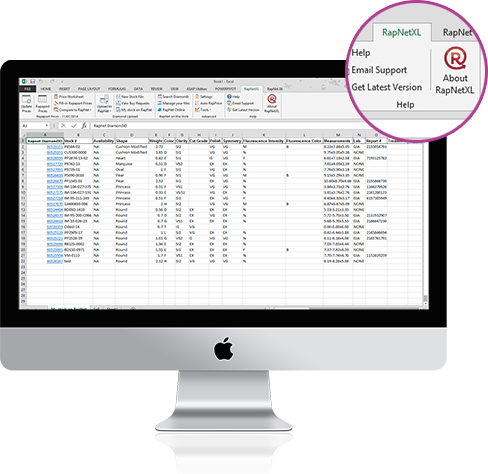 Download RapNet® Buy Requests from the RapNet® to Microsoft® Excel®. Fixed bug when clicking "Fill in Rapaport Price" an additional column is added each time. Fixed bug on Stock File when clicking "Fill in Rapaport Price" and choosing change discount the price would be set to 0%. Microsoft® and Excel® are either registered trademarks or trademarks of Microsoft® Corporation in the United States and/or other countries.